When I give a book three stars, it simply means indifference; I enjoyed it, but ultimately, it is a forgettable read. Thus, I am unable to remember why I picked up Timekeeper in the first place when its predecessor, Timeless, was equally as unremarkable for me. I suspect it has something to do with that cliffhanger ending and possibly my thirst for more historical fiction in YA. Whatever it may be, I read Timekeeper in a matter of hours, skimming through this short story and enjoying it, knowing that fans ofTimeless would be more than pleased but also knowing that, unlike most, Monir hasn’t improved greatly as an author or a storyteller from her debut piece. Timekeeper picks up directly where Timeless left off, with Philip Walker, the man Michele fell in love with decades ago, somehow finding a way back to Michele’s present-day existence. In an unlikely turn of events, however, Philip remembers nothing of Michele. Yet, as much as Michele desperately wants Philip to remember her, a new evil is on the horizon. A spirit from the past, one who holds a grudge against her and is responsible for all the wrong in Michele’s life, has made a new plan, one that will kill her, for Michele is the product of a human from the present and one from the past and really shouldn’t even exist in the first place. As Michele races against time – once again – and fights for her love, she comes to know about who she – and her father – really are and ultimately embrace her abilities as time traveler. I have to give Monir props by making this duo one with such an interesting set-up. As an avid fan of Doctor Who, I love time travel stories and Timeless definitely wow-ed me in that sense. Its time travel theories were impeccable and the rich history of the Gilded Age that colored every page kept me riveted. 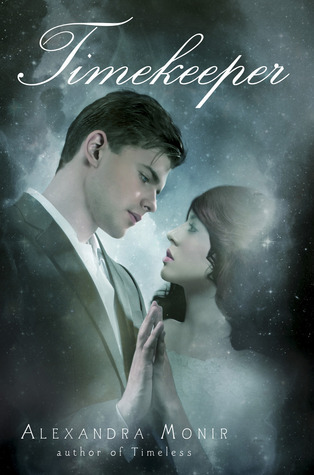 WithTimekeeper, on the other hand, Michele doesn’t do as much time traveling as she does reading the pages of her father’s journal, coming to learn who he is and uncovering an organization dedicated to time travel. In my eyes, all these new rules and regulations that were put place by this time society took away from the thrill and excitement of the time travel element previously present in the novels. Furthermore, I found myself missing Michele’s actual adventures in the past and while her father’s voice through his diary entries was unique and recognizable, it wasn’t as riveting as it could have been, causing me to skim the pages quite a few times. In addition to that, the romance element was dealt with in a very unique manner. Philip Walker, the new kid in Michele’s school, feels something for Michele, but he fails to remember their past. It was sweet to see them nearly fall back in love with one another, joined by their love for music, and while the semi-insta-love inTimeless clearly bothered me, I was less concerned about it in this story. I will say that the ultimate reason to explain Philip’s presence in Michele’s world is a little far-fetched, though believable. It requires a little suspension of belief, although it does make complete sense, so I was a little skeptical, but pleased, and the ultimate conclusion of this romance. What make Timekeeper a novel that is forgettable, though, is that it builds up to an obvious confrontation with the villain, only to solve it with a small action that renders this novel practically pointless. If it was so easy to kill the villain, why not do it years ago when Michele’s life wasn’t in danger? Plus, the story ends off very neatly, but I would have liked something more to see how Michele dealt with her newfound responsibilities, not to mention the fact that her friendships which I so adored in the first novel took a backseat in this one. Timekeeper is a very short story, which is why I read it in the first place, but it really isn’t a series I’d completely recommend. It’s enjoyable, interesting, and the concept is intriguing, but more than that, this series unfortunately does not have to offer. Well that's a huge bummer about the confrontation at the end! If there's a huge build up, I like a rather epic showdown with the villain, or at least the promise of a future epic showdown with villain, so I can see how it would be frustrating that with one small action everything is solved. I do love time-travel stories though, so I'm intrigued by that aspect of this series:) Have a great weekend Keertana! This book sounds like a great idea, with middling execution. I got the first one from the library ages ago and had to return it before I finished, and I have to say I haven't felt any need to pick it up again, hah. I think I'd feel the same overall indifference if I had continued. Great review, Keertana! Ooooh, that annoys me so thoroughly when everything is solved simply and easily. Other than that it sounds like there are some good elements to the novel, particularly with the time travel twist. I'm sorry to hear you didn't enjoy this one, Keertana, but I don't think I'll be picking it up. Huh. Thing is, I love time travel stories, bit if they aren't done properly, they just confuse the heck out of me. The instalove would have bothered me too, and the predictable, anticlimactic ending doesn't help either. I think I'll stay away. However, I'm glad that there were things you liked, despite your opinion overall. At least it wasn't a complete waste of time. Fantastic and thoughtful review as always, my friend. I'm immediately taken with that cover, it is just gorgeous. I have to say I'm taken with short stories at the moment but I can see the flaws in it as well. I haven't taken up this series yet though, but it may be on my list for the future. I am a huge Doctor Who fan (Team Tennant :P) and I can definitely see the attraction and concept of the plot. I would be very intrigued as well. I'm sorry its disappointed you. Wonderful Review, Keertana. If you like time travel, you really should read the Ruby Red series. It is so amazing in so many different ways and so much better than this one. I'm sorry but it's true! Hehe. Also perhaps because it is translated from German, there is this freshness about it that is so refreshing when compared to the novels churned out by North American novelists. I liked the first book, but it definitely didn't WOW me. I have been excited about this one and curious to see what happens but now I'm thinking I may wait and watch for it at the library. I loaned out the first one to my family and if they loved I'll probably have to buy this but otherwise I'll borrow it. I agree with the sentiment about RUBY RED. LOVE LOVE that series. I know we've talked about it before, and how you will probably wait until book 3 to read it. Thankfully, that's supposed to be sometime this year! Anyway, I am still on the fence about this series. It's one of those where I read the first book and liked it, but with so much else to read, it kind of got pushed to the side of my brain. I think when my TBR settles down, I'll pick this one up.